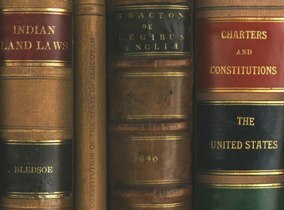 The Law Library's mission is to support the scholarly and instructional activities of the Law Center's faculty and students and to serve the research and informational needs of the University, the legal community, and the public. The Law Library strives to provide our patrons with access to a rich collection of research materials in both print and electronic formats. The collection’s strengths include energy law, water law, agricultural law, Native Peoples law, and Oklahoma law. The Native People's Collection of the Law Library is an in-depth collection of legal, historical, and cultural materials relating to indigenous peoples with more than 4,000 volumes.